I love walnuts! They taste great in salads, yoghurts, cakes and on their own! They are a rich source of many minerals, while also providing protein, healthy fats and vitamin E. It’s very easy to add them into your diet, either as a snack or as an extra ingredient. 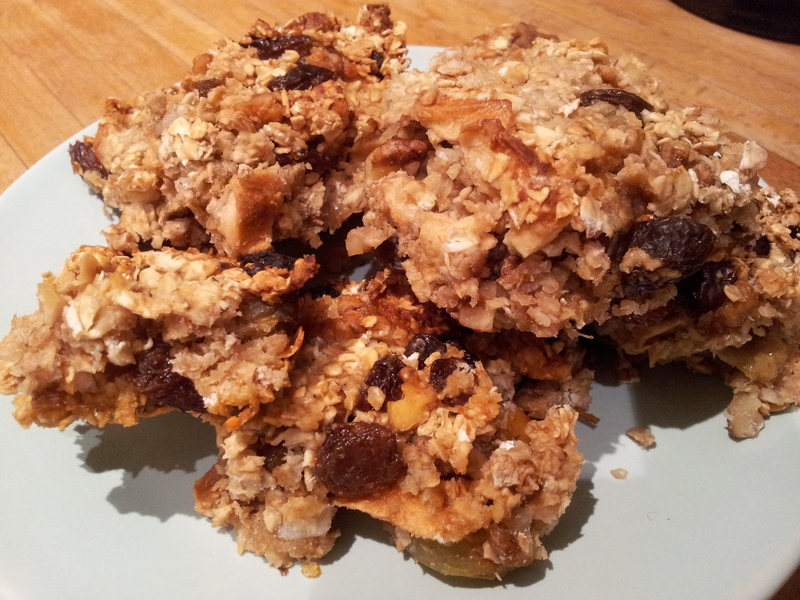 These flapjacks are lovely, and the apple/walnut combo is a match made in heaven! 2. Using a pair of kitchen scissors, chop up the dried apple into small chunks. 3. Mix together the oats, chopped dried apple, sultanas and chopped walnuts in a large bowl. 4. Stir in the pureed apple. 5. In a separate bowl, mix together the yoghurt and the honey, and then add that to the oats. 6. Make sure all of the ingredients are well-combined, add them into the pre-lined tray and press them down slightly. 7. Pop in the oven for around an hour, or until the edges begin to crisp. 8. Slice into 12 pieces and store in an airtight container.